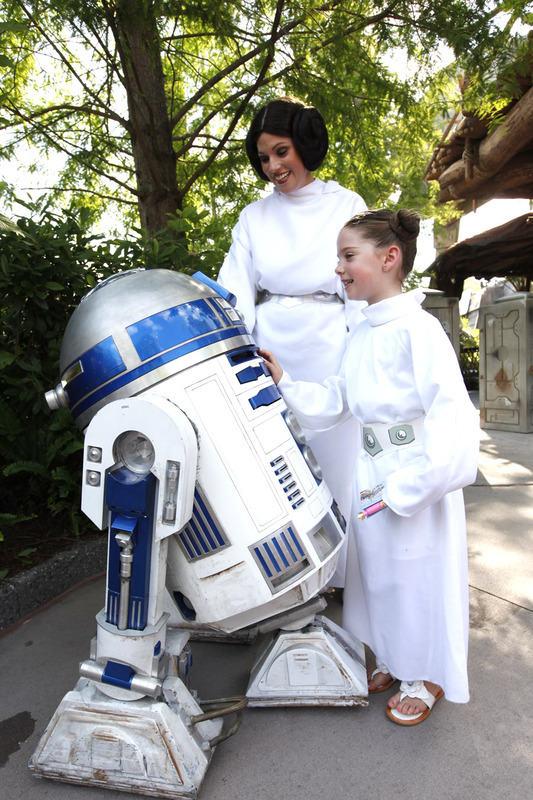 Star Wars Weekends, the Force-filled fun-fest that takes place annually at Disney’s Hollywood Studios, returns to the Walt Disney World Resort galaxy every Friday, Saturday and Sunday from May 17-June 9, 2013. A celebration of all-things-Star Wars, the special event is included in regular park admission to Disney’s Hollywood Studios. Among the features: special Star Wars-themed parades, appearances by Star Wars celebrities, special additions to Jedi Training Academy, Star Wars-themed talk shows, behind-the-scenes presentations, limited-edition merchandise, a nightly dance celebration and more. The centerpiece of the celebration is Star Tours: The Adventures Continue, the immersive 3-D attraction that speeds guests through worlds featured in the Star Wars saga. This year’s event includes a nod to the 30th anniversary of Star Wars: Episode VI Return of the Jedi, which debuted in theaters in May 1983. Two Star Wars film legends – one who portrayed a villain and one who portrayed a hero – will double the fun in two consecutive weekends. Action star Ray Park, who portrayed the Sith warrior Darth Maul on the silver screen, is one of the celebrity guests in Weekends I and II. Actor Warwick Davis, known to Star Wars fans as everyone’s favorite Ewok, Wicket W. Warrick, is one of the guests during Weekends II and III. Also showcased at the event: the largest collection of official Star Wars characters gathered at any theme park in the world, roaming the areas and posing for meet-and-greet and autograph opportunities in front of themed scenery. For more information about Star Wars Weekends and the latest event updates, guests may check the Disney Parks Blog (disneyparksblog.com — Keyword: “Star Wars”), the official Star Wars website (StarWars.com — Keyword: “Disney”) and the official Walt Disney World Resort website (disneyworld.com — Keyword: “Star Wars Weekends”). Star Wars: © 2013 Lucasfilm Ltd. & TM. Having several Star Wars fans in our office here at Global Resort Homes, we thought it would be fun to spend the day and share some of the fun with you. This Friday, May 24th, we will be Tweeting and doing Facebook posts from Disney’s Hollywood Studios, to bring some of the excitement to you! Interstellar Autographs with the Stars – get an autograph from an actual Star Wars celebrity! Each weekend there will be new celebrities there ready with their sharpies to make those fans’ day! A FASTPASS ticket ensures your place in line at the celebrity autograph kiosk outside the Front Gate entrance.Grab a FASTPASS ticket before the park opens, as quantities are extremely limited and are issued on a first-come, first-served basis. Once FASTPASS tickets have been distributed, stand-by tickets may be issued, although stand-by tickets do not guarantee an autograph. Meet Favorite Characters – get a photo opportunity to make all your friends jealous! Star Wars characters you may see – Darth Vader, Darth Maul, Boba Fett, Jango Fett, Zam Wesell, Aurra Sing, Stormtroopers, Tusken Raiders, Gamorrean Guard, Anakin Skywalker, Commander Cody, Captain Rex, Ahsoka Tano, Asajj Ventress, Shaak Ti, Kit Fisto, Jawas, Troopers, Queen Amidala, Chewbacca, Ewoks, Cantina Band, Leia, Luke, C-3PO, R2-D2….and even Jedi Mickey, Leia Minnie, Stormtrooper Donald and Vader Goofy! 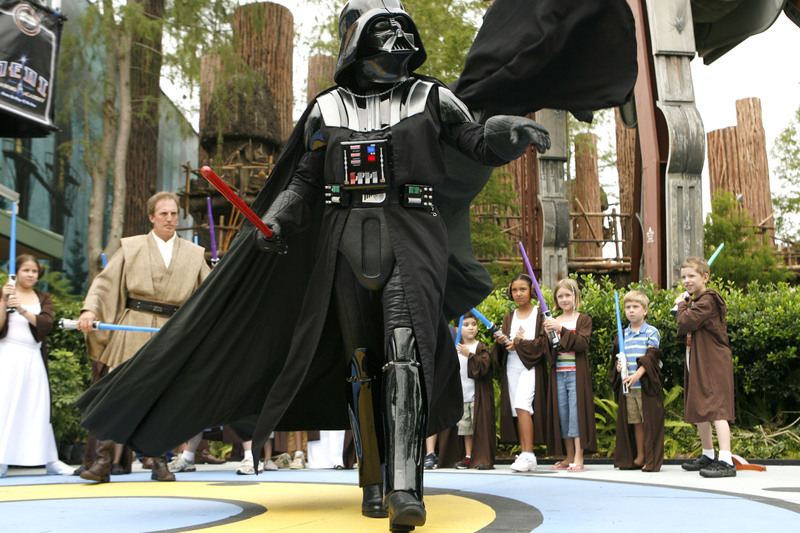 Star Wars Shows and Tales – and even a PARADE! Jedi Training Academy – for those kiddos 12 and under! Junior Jedi knights learn to use the Force at this 20-minute training academy as they prepare to meet the Dark Side. Star Tours – The Adventures Continue – Ride the Ride – over 50 possible scenarios so each ride could be different. Purchase Exclusive Merchandise – Hurry before they run out!